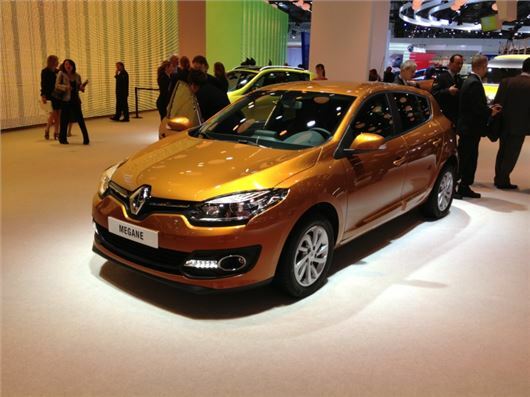 Renault has unveiled a new look Megane at the Frankfurt Motor Show with a new front end look echoing the latest Clio. The five-door hatchback, Coupe and the Sport Tourer estate all get the refreshed styling and will go on sale here in spring 2014. The Megane line-up will receive Renault's new 130PS petrol power mated to the Efficient Dual Clutch transmission. Renault claims that the new drivetrain combination will deliver a more responsive drive, thanks to its re-tuned turbo. The emphasis has been placed on low-rev pick-up, with the turbo boosting earlier. The biggest visuual change is the adoption of new elliptical headlights and integrated daytime running lights. The bold new look, which transforms the outgoing and rather plain looking Megane is being rolled-out across the range, as it takes on the new brand identity. So, the new front end will also be common across all Megane models. Renault is talking up the quality aspect of the Megane, citing its above-average performance in consumer satisfaction surveys. It cites its performance in the German ADAC 2012 (Allgemeiner Deutscher Automobil-Club) survey ranks Mégane as 'good' or even 'excellent' over the service period between 2007 and 2012.